"...It's pretty much business as usual for radio as practiced in the United States of America today. It boils down to: formats that make money stay; formats that lose money go away. INDIE wasn't even independent. There was no pirate ship of swashbuckling programmers and music heads beholden' to no one, ravaging the high seas and singing Vampire Weekend songs while drunk on grog. INDIE 103.1 was the creation of Clear Channel..."
"By this time there were now 18, yes, eighteen specialty shows on the station. The music was, to say the least, eclectic. It was hard to believe this was an actual commercial station and not NPR, or college radio...It was just too much for the average listener. A plethora of riches that appealed to the very few, and the very hip. After the initial check-out people went away and did not come back. The station was too difficult to listen to for long periods of time. Too unfamiliar. At times even difficult to pin down what the station actually was due to too many specialty shows clogging up the format." "If your content can't get ratings, and sales can't sell it, you disappear from the airwaves. Even though you know, because listeners swarm to your events, clog your blogs, and buy the music, that you have a viable audience. But if Arbitron can't track them they clearly don't exist. And that's the shame of American radio today." I guess college radio is lucky that we're not beholden to ratings. And, my assumption is that college radio listeners are very different from commercial radio audiences. Fans of college radio often "ride it out" through unfamiliar sounds because of the adventure and the joy of discovering new musical treats. What do you think? Is it easier to listen to commercial radio or college radio? And why is unfamiliar music seen as so scary? "...the financial obligation of WMUB can no longer be borne by the university with the economic challenges we face," said Miami President David Hodge. The university chose not to sell the station, as it would have likely meant losing the public radio programming that it now provides to the Miami Valley. This decision follows a two-year process of exploring options for the future of WMUB, which did not result in an economically viable way to continue WMUB as a stand-alone station. Under this operating agreement, WMUB would join public radio stations WGUC FM and WVXU FM, which are owned and operated by Cincinnati Public Radio. WVXU and WMUB currently offer similar programming. With this alliance, WMUB will maintain its emphasis on news and information offerings on 88.5 FM as well as offer opportunities for student development." Although this news is not the same as a campus losing a radio station completely, it is a sad move in terms of the increasing homogenization of radio and loss of local programming---even among public radio stations. An opinion piece in The Isthmus discusses Madison Wisconsin station WSUM (Stop 2 on the "Spinning Indie 50 State Tour") and its new studios. The author talks about a $400,000 grant for the station move and writes, "The question is, what will WSUM do with its newfound wealth? Will its programming grow to reflect the quality of its facility? Or will it squander this amazing opportunity?" Although the author praises WSUM programming, saying, "when WSUM shines, it can be brilliant," he also critiques the station for being "...notoriously uneven, and not something a new studio can fix." Do you think shiny new studios and mounds of cash should lead to a more professional-sounding station? I'm not sure...But, I do think that DJs and staff should feel very very thankful and should work their hardest to do great programming. My greater reaction to this story, though, is that especially in these economic times, it's fantastic to hear about a college radio station that's getting such strong support from the administration. Clearly they understand the importance of student radio. An article about budget cuts at Middle Tennessee State University states that one of the casualties of their financial crisis may be the student radio station. An earlier article states that the radio station in danger of closing is public radio-affiliated jazz station WMOT. In a nice statement of solidarity, student-run radio station WMTS is hosting a benefit to help save their sister station. I'm still keeping the faith for the DJs and staff of Texas Tech student radio station KTXT. The station was shut down without warning in December and its supporters are still rallying, writing, calling, and emailing in order to get the word out about the situation in order to hopefully keep the station alive. 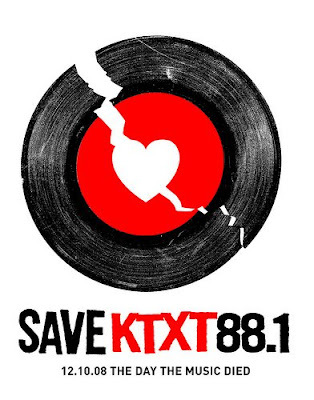 "Control of KTXT-FM's license has been transferred to Tech-owned KOHM-FM, Tech officials announced Friday. Should Recycled Vinyl Record Art Make Me So Sad?